The show comes back September 9th and looks better than ever! Check out this juicy trailer! In other excellent news, Ian Somerhalder was voted as the sexiest beast during Entertainment Weekly's tournament. There are simply no words for how much I love this! Most important! 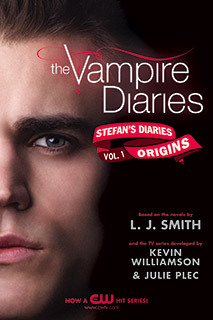 I will be recapping the Vampire Diaries every week right here on the blog! I invite you to link up your own recap posts. This will be an ongoing part of the L.J. Smith challenge. I'm adding The Forbidden Game trilogy as the books to read this year, and will be making the announcement a little later than originally planned because I hope to do something fun with it! Haven't read the Forbidden Game? One word for you. Julian. The Forbidden Game was recently rereleased in omnibus format from Simon Pulse. These were my favorite L.J. Smith books growing up. Who's excited for the Vampire Diaries to come back?